A simple modification to gain voltage controllable wave shapes from Doepfer’s A-147 VCLFO. 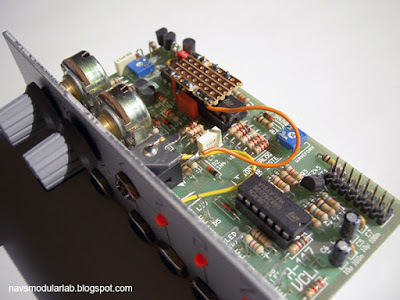 Learn how to turn this old stalwart into a morphing modulator with just a couple of resistors. 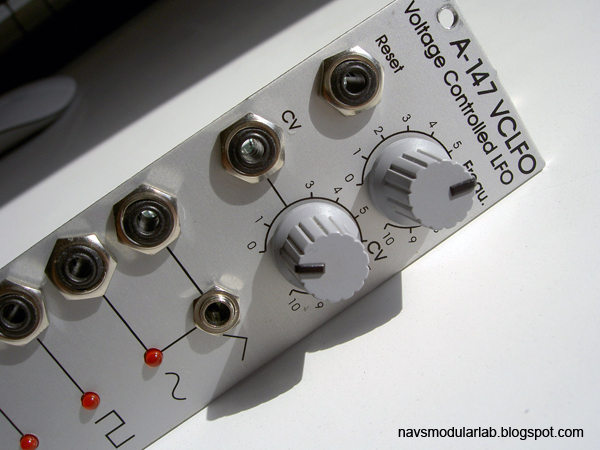 The A-147 is a triangle/square-wave oscillator built around the pairing of an integrator and comparator. They work in a loop with the one feeding the other, back and forth. You can see them in action here. The result of integrating a square wave is a triangle. But if we independently change the rate at which the integrator charges and discharges, we can skew the waveform from a rising to falling sawtooth via a triangle. Because the integrator and comparator are related, the square wave becomes a variable width pulse. The easiest way to achieve this is to hijack the square-wave on its way to the integrator, split its path with two diodes and then set the balance with a potentiometer. You can see this manual arrangement in Ray Wilson’s Variable Skew LFO or Ken Stone’s Utility LFO. The idea is to massively reduce the size of the square wave going into the integrator so that the injection of an external voltage is enough to shift the bias of the square and hence alter the shape coming out of the integrator. Resistor R14 (15k), which is to the left of the quad opamp (TL084) forms a voltage divider with the 1k resistor which also marked in yellow in the picture above. 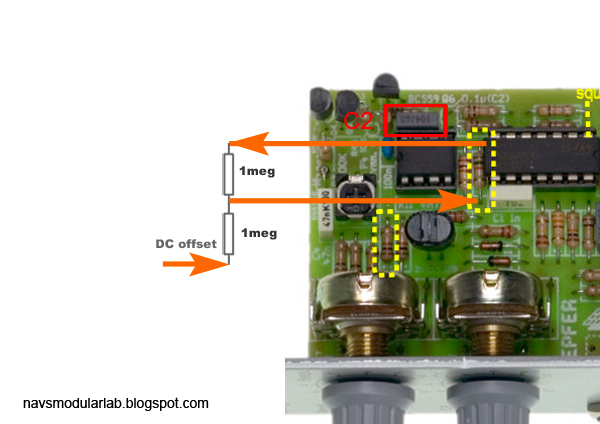 The output of this divider goes to the CA3080 OTA for integration. I found that swapping the 15k for a 1M resistor was enough to allow the bias to be shifted with a +/-5V CV. For the CV input I ended up using two resistors in series to give me 670k rather than the 1M in the picture. Reducing the amplitude of the square wave to the integrator also reduces the overall frequency of the LFO, so I also swapped the 0.1uF capacitor C2 for a smaller 15nF to bump up the speed. Below is how it looks and here are some construction pictures. I like simple mods - minimum change for maximum effect. 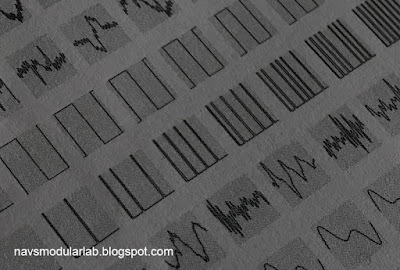 Skewing the wave shape with this method also changes the frequency of the LFO, which you might not want. There is a way to compensate for this, but again, I decided it wasn’t worth the extra circuitry as I like the effect of the LFO slowing down as it changes direction, almost like a thru-zero oscillator. But you could try the following schemes. One is relatively simple, the other might need an expander module to provide space for the extra PCB. Neither is perfect. The idea here is to inject a fraction of the skew CV to the A-147’s FCV input. For example, given a skew CV of 5V I found I needed about 5-600mV FCV to correct the frequency. You can use the attenuator on the module for this or send your skew CV via a ca. 560k resistor to the output pin of the 50k FCV potentiometer (ahead of the FCV buffer). The ‘gotcha’ with this method is that it only works for positive offsets as we always need to speed up the LFO when skewing. What is needed is an active full-wave rectifier to ensure that the compensation voltage is always positive. This is a simple enough circuit to add but for the lack of space behind the panel. If you want to try this, have a look at Jim Patchell’s Ideal Diode Tutorial hosted at René Schmitz’ Schmitzbits site. The usual DIY disclaimers apply - you do this at your own risk. Have fun but take care of your module and yourself! Thank you Tim Stinchcombe for identifying the relevant parts and for your thoughts and suggestions. Driving a wavetable oscillator to get reliable clock multiplication, regardless of changes in tempo. A follow-up to these posts (1, 2). Clock division is easy and instantaneous. Getting faster pulse streams from a master clock is an imperfect science, even with dedicated solutions. Here is a multiplier patch that tracks changes in tempo and avoids the lags and glitches that can affect modules which try to average or predict incoming clocks. In a sense, it’s an analogue rather than digital approach: instead of counting pulses or square waves from a master clock (tap tempo etc. ), we use a sawtooth wave to voltage address a suitable waveform in a wavetable module. If we scan a wave that contains four equally placed pulses (see image above) we can quadruple our ‘clock’. If the amplitude of our sawtooth remains constant - i.e., we read out the entire contents of the page - we will always get four pulses for each single sweep of the saw, regardless of how fast or slow that saw moves. For this patch, I used a sawtooth LFO to drive a Richter Megawave. I multed this saw and used one copy to trigger one envelope (master clock, left channel voice) and patched the other to the input of the Megawave. I patched its output to a second envelope and voice (multiplied clock, right channel). I used the sine waves in ’Miniwave’ (Bank 14, Wave 3) as they are more regular than the pulses in Bank 7. Fortunately, these sines were enough to trigger my envelopes. I kept the multiplication at x4 but modulated the frequency of the LFO (and the pitch of the audio VCOs) with a voltage offset and a clocked random voltage. To get voltage control over the multiplier e.g., jump from quarter notes to 16-ths, we can do two things: either select a new wave via CV or manually select the wave with the most pulses and control the amplitude of the sawtooth with a VCA, as you would with a wave-folder. Much like the old Beat Folder patch, we are re-assigning voltages. But instead of using an analogue transfer function, the wavetable module allows us to look up a series of digitally stored arbitrary values. If you want to read some more about the Megawave and its many uses, head here. The Megawave is full of maths, a ‘best-of’ transfer functions (see the Socket Rocket manual for ideas). This is my sort of module. It’s multifunctional - not because it has many modes but because its principle function can be re-imagined according to the desired use. … to our hosts, Hainbach & Goldwiener and to Luma //Chroma for the mesmerising visuals! 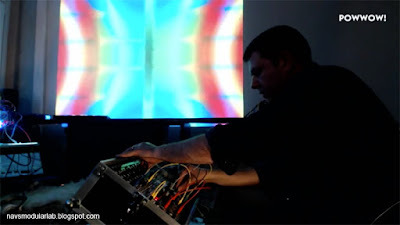 The launch of Powwow Berlin was loads of fun and I’m looking forward to doing it again. I patched a 6U case live, with back-up provided by a Clavia Micromodular and EHX SMMH as delay and looper. Given the short set-up and play time, this was a good selection which provided enough options. It was nice to get back to basics after a couple of virtual modular gigs and I think there’s enough play in this caseful of modules for another outing. 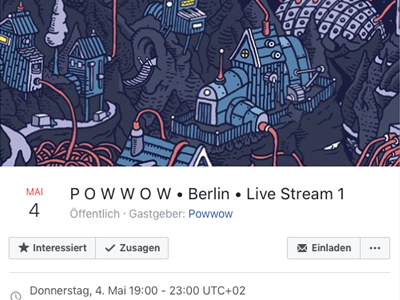 I’m taking part in the first POWWOW Berlin Live Stream this Thursday, 4th May from 19:00. It’s a live modular improvisation over the internet featuring Hainbach, Lindred, Navs, zv_k and Goldwiener. I’ve never knowingly played to a virtual audience before and I’m looking forward to making music with these lovely people, so tune in on Thursday night!